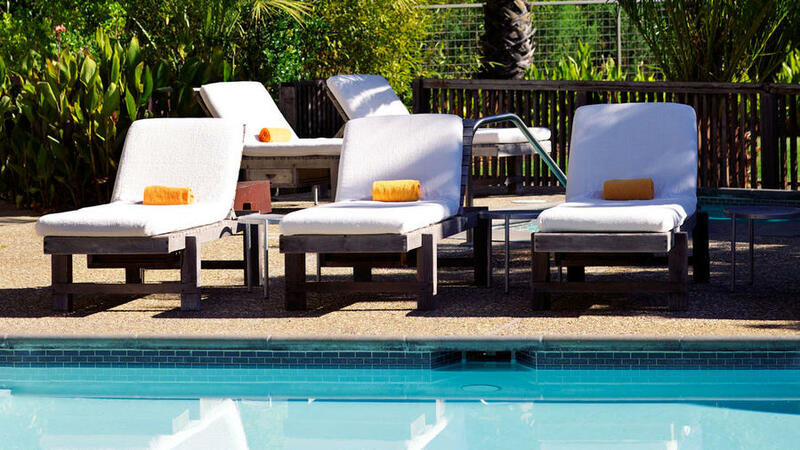 The solar-heated pool at the Boon Hotel + Spa stays between 70° and 80° all summer long. THE ROUTE: California’s West Sonoma County: Sebastopol > Valley Ford > Freestone > Occidental > Guerneville (25 miles). WHY GO: This low-mileage (just 25) route curves through vineyards, redwood groves, and tiny towns, leaving plenty of time to stop for crisp local Chardonnay, a Japanese-style spa, a float on the river, and first-rate dining. WHO IT’S FOR: Women who need some serious quality time with friends. Sebastopol’s Iron Horse Vineyards is known for its sparkling wine. Osmosis. Relax in a fragrant cedar enzyme bath at this Freestone spa, or get a rubdown and stroll the meditation garden. Wild Flour Bread. Across the street from Osmosis, the back garden at Wild Flour is just the place to enjoy whipping cream scones and cheese fougasse. DETOUR: Right over the Russian River Bridge. The 1948 Pee Wee Golf scores with wonderfully peculiar sculptures and characters. 707/869-9321.